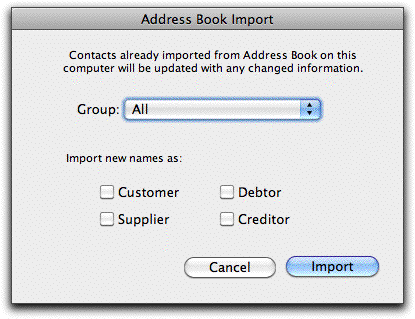 On the Mac only, you can import the address book direct into MoneyWorks. New entries in the address book will be added, and changed entries will be updated. Note that a Creditor is a Supplier who gives you credit, and a Debtor is a Customer to whom you extend credit. Creditors and Debtors are not available in Cashbook. The information in your address book will be transferred into MoneyWorks, with any previously imported entries being updated. Codes for the new entries will be automatically created based on the first few letters of the name.